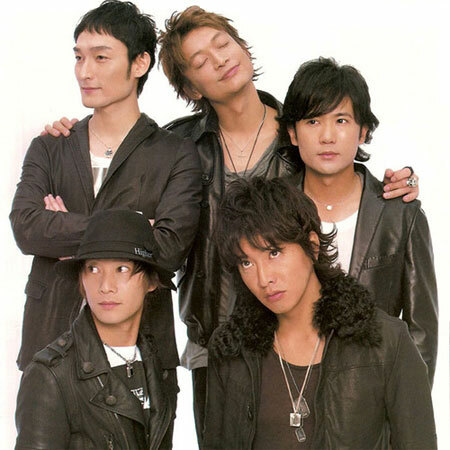 SMAP (Sports Music Assemble People) are a kind of Japanese version of the Monkees, only more enduring and commercially successful. Besides being the country's most popular boy-band (and J-Pop's best selling group ever), they also present their own variety shows, make commercials and frequently appear in trendy TV dramas. As the brightest stars in the ubiquitous Johnny's Jimusho (Johnny & Associates) talent agency, they have a lot of clout behind them, but still they have managed to last longer than most people might have expected. Even rumours of systematic rapes of his young charges by guru Johnny Kitagawa couldn't dent the group's marketability. The group's lineup changed a few times before their official debut, and at times included Sakamoto Masayuki (now of V6) and Kokubun Taichi (now of Tokio). With the final lineup of "leader" Nakai Masahiro, Kimura Takuya (Kimutaku for short), Katori Shingo, Kusanagi Tsuyoshi, Inagaki Goro, and former member Mori Katsuyuki, they started out as skateboarding back-ups to popular roller skating group Hikaru Genji in 1988. The turn of the decade saw the end of the so-called 'idol groups' but clever marketing by their agency ensured that the members of SMAP were everywhere - TV shows, concerts, musicals, commercials, radio. Kimutaku in particular became the poster boy for his generation and could demand huge fees for commercial appearances. Singles such as Gambarimasho, Celery, Sekai ni Hitotsu Dake no Hana have been huge sellers. Even the departure of Mori in May 1996 to pursue a career as a motorcycle racer couldn't stop the SMAP juggernaut. Thanks largely to their popularity, Johnny's Jimusho has become easily the most successful agency in Japan, with earnings of almost 3 billion yen in 1995.